Do you have multiple order types that require different picking methods? If you sell into multiple markets, you probably have different order profiles set up, making pick planning a tedious task. Wouldn’t it be nice to be able to automate your process? RF-SMART’s Pick Planner allows you to plan picking tasks using various criteria, such as: Multi-Order Picking by Tote, Zone Picking, Wave Picking, or Pick by Unit of Measure (UOM). By setting up a single Pick Plan in NetSuite, multiple tasks are sent to the mobile devices instantly and take your workers on the most efficient route through the warehouse. Warehouse Manager: Determines the criteria for the day’s orders and creates a pick plan right inside of NetSuite. They can either release the plan then or schedule it to run at a specific time. Pick Planner reduces the time it takes to determine how to group or split orders, optimizing the picking strategy for you. Warehouse Worker: Receives their task on the mobile device and simply picks the orders using standard RF-SMART mobile functions. With RF-SMART, the worker is sent on the most efficient path through the warehouse, but also given the flexibility to make changes if needed. For example, counting can also continue while items are being picked. 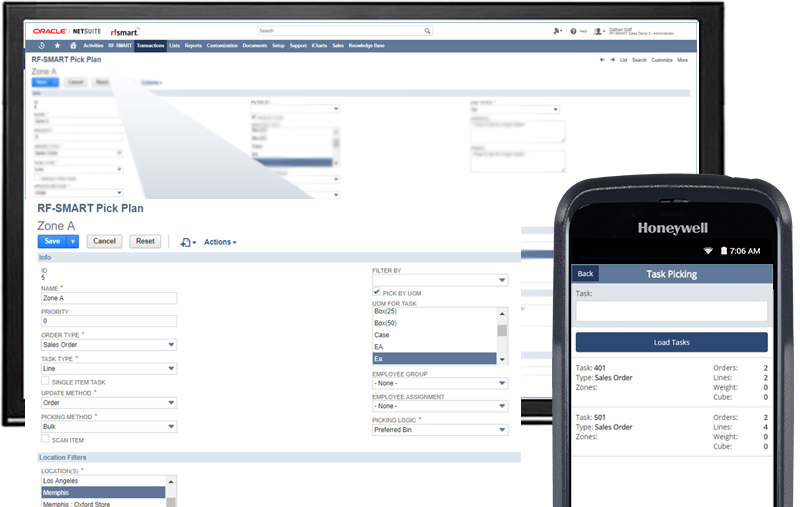 Once complete, tasks are updated in real-time in NetSuite, and an item fulfillment is created for the task or order. Read why Mack's Prairie Wings thinks RF-SMART is "hands down the best WMS solution for NetSuite." Automate your Picking Tasks in NetSuite.